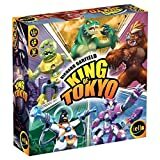 King of Tokyo is a dice rolling and card drafting game for 2 to 6 players where you play as mutant monsters, rampaging robots, or even abominable aliens battling in a fun, chaotic atmosphere. You choose one of six monsters. You roll 6 and may reroll some of them. You must choose your strategy: will you attack your enemies, heal your wounds? or improve your monster? 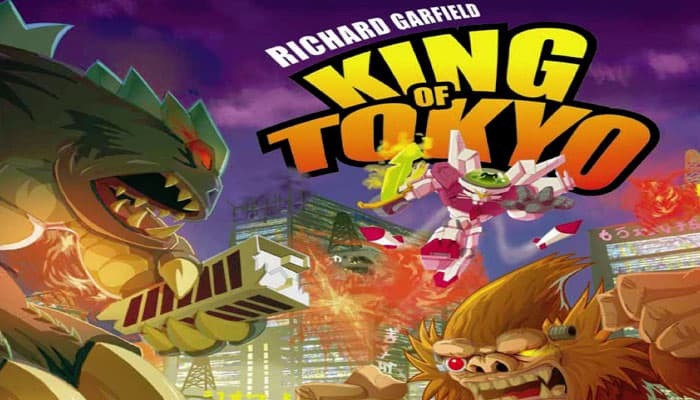 The die faces are power (to collect power tokens), health (deal damage), attack (player outside Tokyo), 1, 2, and 3 (victory points). Improve your Monster or stomp your path to victory. Destroy everything in your path to become the one and only by gaining 20 victory points and win the game. The game plays clockwise. Each player rolls the 6 black dice. Whoever has the most results goes first. In case of tie, players roll dice until one player has the greatest number of . 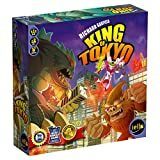 You are a gigantic Monster willing to do anything to become King of Tokyo. Your rampage brings you glory in the form of Victory Points ().